The iconic Mt. Fuji has 5 lakes at the foot. Lake Kawaguchi is the largest of them. This post is all about Lake Kawaguchi’s attractions, visitor information, helpful links, and an interesting folk tale again. Mt. Kachi Kachi Ropeway is one of the most popular tourist attractions near Lake Kawaguchi. The gondolas take us to the hilltop with breathtaking views of Mt. Fuji and Lake Kawaguchi. It is also known as one of the best Autumn Color spot around Mt. Fuji. The local staff members say Mid-November, when all the trees turn red and yellow in the hill, is the best season to visit there. Raccoon Dog and Rabbit welcome us at the station. When you get off, you’ll be here. A cozy place with a beautiful hiking course. There is a Free Photo Service. The staff members will take a picture of you with Mt. Fuji from there by their camera and your own camera. It is really free to get the mini photo card. Don’t hesitate! You’ll see beautiful nature of the hill, the towns and the long foot of Mt. Fuji. Whichever you are having a date there or not, this bell let us feel cleared up fronting with sacred Mt. Fuji. So, Mt. Fuji managed to show me its head! Why are Raccoon and Rabbit the characters in Mt. Kachi Kachi? It’s based on a well-known Japanese folk tale titled, “Kachi Kachi Yama (=Mt. Kachi Kachi. )” It is said that this mountain is its scene. Once upon a time, an old couple, Raccoon Dog and Rabbit were living in a village. One day Raccoon tormented Grandma. Grandpa got very sad, so Rabbit avenged her on Raccoon. Rabbit gave Raccoon some firewood kindly and followed him when he went up to a mountain. Rabbit made a fire by flint and put it on the wood on his back. Raccoon got burnt, screamed and regretted his wrongdoings. The flint’s sounds, “Crack, crack” is, “Kachi Kachi” in Japanese, so the mountain started to be called Kachi Kachi Yama(=mountain) afterwards. However, there are some different versions for this tale. The problem is that the original is too cruel. Raccoon killed Grandma, and fatally, made Grandpa eat her by cooking soup for him! And Rabbit killed Raccoon in revenge for Grandma at last. Totally TERRIBLE. Although I know many of folk tales in the world are a bit aggressive, I don’t think there are many as cruel as this. So, in most cases, the story is published as a mild version, where Raccoon just bullied Grandma, Rabbit punished him and he apologized to them. At last little children can enjoy it on a picture book. But somehow Mt. Kachi Kachi shows the original version on the panels…. Why? Anyway, Rabbit is a guardian of justice here. They are sitting on gods’ place at the small shrine. A Rabbit at the shrine! And Raccoon is not treated badly, either. These rice dumplings with sweet soy sauce were so warm, delicious and reasonable. I really recommend it when you visit there. The pronunciation Tanuki is similar to “leave others behind” in Japanese, so these dumplings with Mt. Fuji printings carry the wish to be outstanding. Just in front of Mt. Kachi Kachi Ropeway, you can enjoy the cruising ship in Lake Kawaguchi. The cruise ship departs every 30 minutes, takes 20 minutes to return. 930 yen for adult, 470 yen for elementary school student. Tip: If you go to Mt. Kachi Kachi Ropeway and En Soleil on the same day, there is a combined discount ticket. It’s a great saving! And many of Fujikyu Line train tickets offer a discount for these attractions, so ask them. The open-air deck in the 2nd floor is the best! Cruising to the best spot! There is a bridge half the way. This is known as a great spot to see, “Upside-Down Fuji (Sakasa-Fuji in Japanese. )” Lake Kawaguchi becomes a mirror which shows Mt. Fuji’s reflection on a calm sunny day. Sakasa-Fuji is counted as one of the most beautiful views of Mt. Fuji. This bridge is sign of the best Sakasa-Fuji spot. I strongly hope to meet Mt. Fuji on the ship someday. Lake Kawaguchi Fall Foliage Festival is 1 to 24 November (in 2014.) The Maple Leaf Pass is quite famous. Do you like the first photo of this post? Mt. 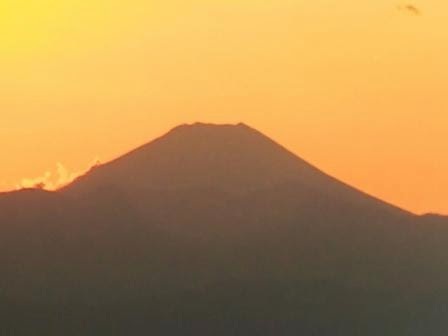 Fuji is so beautiful at sunset. Actually, I did NOT take the photo from Lake Kawaguchi. It was taken in Tokyo. In Yamanashi Prefecture and Shizuoka Prefecture. Yamanashi Prefecture is right west from Tokyo. A 10 minutes walk from Kawaguchiko Station of Fujikyu Line. There are also buses for sightseeing. A Video to Go to Mt. Kachi Kachi Ropeway from Kawaguchiko Station: http://youtu.be/RqWRsNf90Dw Mt. Kachi Kachi Official Website prepared this video for international independent travelers. So kind! Mt. Fuji and Lake Kawaguchi are not places of world wide hotels like Hilton, but there are some 5-star awesome traditional Ryokans. Most of them feature hot spring bathes (Onsen in Japanese) with stunning views of Mt. Fuji. Fujikawaguchiko Onsen Konanso – A 5-star, traditional style, lakeside hotel. It is convenient to go to the attractions in this post and Lake Kawaguchi Station, too. Shuhokaku Kogetsu – You can expect to see Mt. Fuji itself and Mt. Fuji Reflected on Lake Kawaguchi (Sakasa-Fuji) on calm sunny days. breathtaking views. Highland Resort Hotel & Spa – A great hotel right next to Fujikyu Highland, the amusement park run by Fujikyu Railway. I love the story – but it's VERY bloodthirsty! No wonder children get the mild version! I think I would recognise Mt Fuji anywhere, but maybe one day I'll get to see the real thing! Oh, hi, Red! I suppose there were some errors in comments on Blogger. I read some in other blogs last week. I really understand that Grandpa got heartbroken enough to be sick. Of course! !